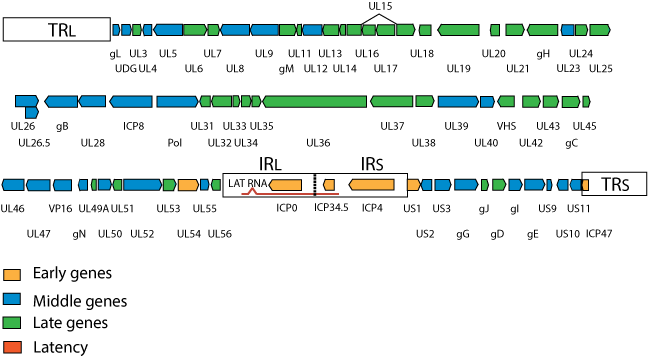 The genome of HHV-1 is linear, double stranded DNA composed of 152,000 base pairs. It contains two unique regions (UL and US), each flanked by inverted repeats (TRL/IRL and TRS/IRS). This structure is characteristic of Alphaherpesvirinae. In addition, HHV-1 genomes are terminally redundant, containing a sequence of a few hundred base pairs that is repeated directly at the genome termini. The genome encodes about 75 proteins that are differentially expressed. 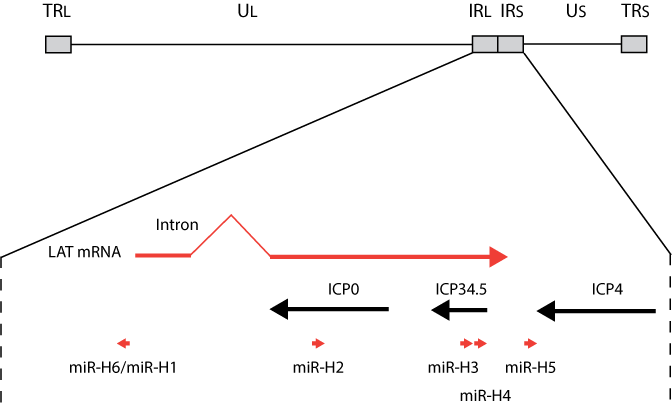 First the early proteins are synthesized to activate the transcription of middle and late genes. Middle genes are responsible for the DNA replication while late genes are mostly structural proteins. In addition, duing neuronal latency, the genome becomes circular and transcribed few RNAs, including two LAT RNAS (2 kb and 1.5 kb) and 8 miRNAs. Several of the miRNAs produced plays a role in the inhibition of Immediate early protein ICP0, ICP4 and ICP34.5 expression inhibition.